Some of the best raw fish in town is at this small, unassuming West Rogers Park hideaway. 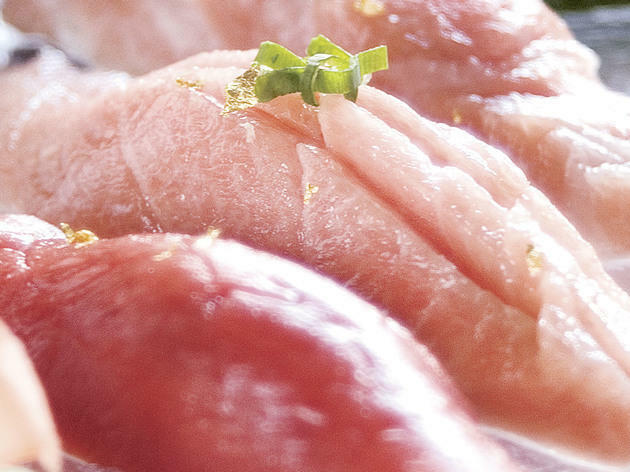 You’ll find such incredibly fresh, melt-in-your-mouth yellowtail, bluefin, mackerel and fatty tuna that it seems almost silly to come here for anything but the sashimi omakase. But there's also restrained maki, like a fresh mountain yam roll with plum and shisho to round out your meal. Beyond the raw, Katsu’s crew has skills on the grill, turning out a tasty marinated duck breast and a crispy yellowtail collar that's great with a dab of shaved, pickled daikon, a sprinkle of sea salt and a spritz of lemon. Sushi is grossly overpriced. I understand it's coming from Tsukiji fish market in Japan, but Tsukiji is West Town also sources their fish from there, and prices are less than half of Katsu. We did the $185 omakase which is not truly an omakase. The chef doesn't change the menu ever. If you look at pictures of the nigiri people have posted over the years, it's always the same. Since it came with 8 piece singular nigiri, we added the 10 piece nigiri to see what else came with. It was clam and octopus. The pieces of nigiri were very large. So large that I couldn't even enjoy the fish. I was concentrating on chewing. The best part of the meal was the first dish, the bluefin tuna with a quail egg. From there, this place does not live up to the hype at all. Additionally, there is a $25 corking fee per bottle. Way too expensive! Save your money, go somewhere else! The neighborhood is actually Nortown, Not “West Rogers park”.